Cradle rollers are an essential part of pipeline construction and utility projects, as they can provide a high degree of control to lifter and crane operators. Most polyurethane rollers are mounted and remain in place while pipeline or other materials are drawn over them. However, cradle rollers are different, as they are almost always attached to a lifter to augment the lifter’s function. This is critical, because oil and gas companies are challenged constantly to execute their projects as safely and efficiently as possible. Polyurethane cradle rollers are simple components that are made with an ingenious design. A typical cradle consists of a steel-reinforced frame that is attached to the crane itself. The frame splits into a pair of arms, and from each arm is suspended a looped cable. Polyurethane rollers and spacers are strung on the cable, creating a sling that consists of a pair of double looped cables. Polyurethane rollers greatly improve control of the pipeline. By far the top priority on a pipeline construction site is safety, with efficiency right behind it. Every time a lifter picks up a piece of pipe weighing several tons, it’s a risk to everyone involved. Cradle rollers keep the pipeline centered and spreads out the force the pipe exerts on the lifter. This protects the lifter from failure and guards the safety of nearby workers. Polyurethane affords precise movement of the pipeline. Lift operators can waste a lot of effort on guiding pipeline from one point to the next. But it’s often a necessary time expense, because the slightest mistake in control can cause the pipe to swing and waste even more time. Oil and gas companies demand top efficiency from their projects, and cradle rollers offer it by ensuring there is no wasted movement in guiding pipeline to its intended spot. Cradles allow lift operators to readjust their position on the pipeline without having to place it down and move the crane head. Instead, the cradle can be rolled up and down the pipe quickly and safely. Polyurethane components take it easy on the pipe. Any damage done to the pipeline is a possible failure waiting to happen. It’s something that oil and gas companies just can’t afford to happen. 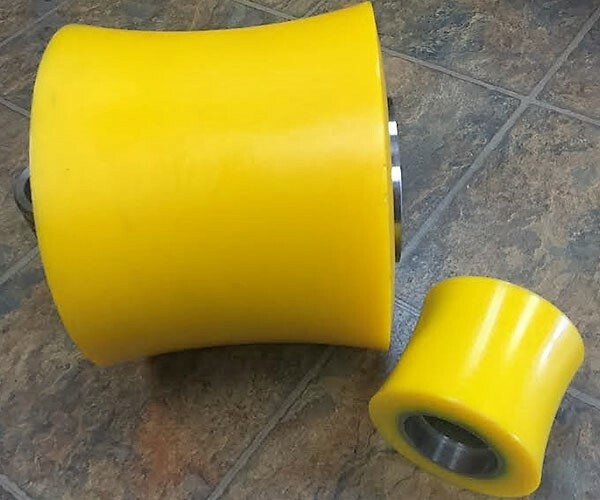 Polyurethane is exceptional at material handling, in part because its smooth, low friction surface means it will not abrade the material or dent it. Lift operators can freely shift the cradle to any position on the pipe without fear of causing damage, or even scuffling the line. These components also prevent pipeline from shifting during transport, so the chances of the line contacting the ground or something else are greatly reduced. Polyurethane components are made from durable, reliable materials. Polyurethane is already used in a huge variety of oil and gas applications. This is largely due to polyurethane’s unsurpassed resistance to various physical, thermal and corrosive forces. Polyurethane is also more resilient than other materials, including plastic and metal, so it will give when exposed to intense compressive forces, much like those experienced during pipeline lifting operations. In short, polyurethane’s broad spectrum durability is equal to or better than metal’s, plastic’s or rubber’s, and it is less expensive to fabricate, in both time and money. There is no alternative to polyurethane components. Their cost effectiveness and reliable design makes them a standard option in pipeline construction projects, and allows oil and gas companies to prioritize safety and project speed simultaneously.